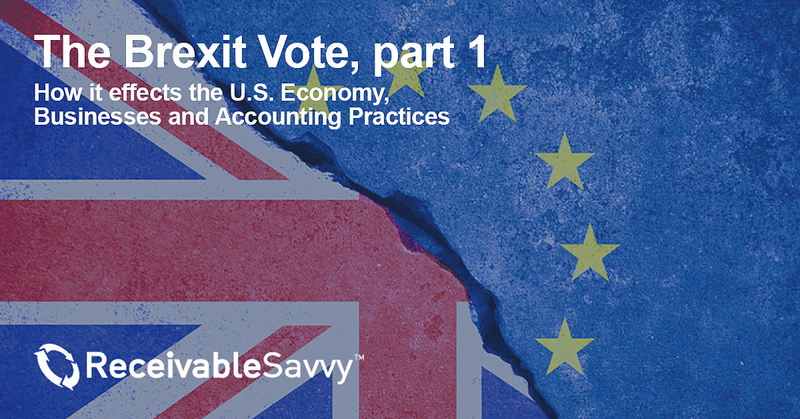 The Brexit Impact on the U.S. Economy, Businesses and Accounting Practices - Part 1 | Company Newsroom of Receivable Savvy, Inc. The Brexit decision leaves in its wake a number of uncertainties and unknowns as well as a great deal of speculation. Atlanta, GA, July 12, 2016	(Newswire.com) - ​​​The recent referendum vote held in the United Kingdom saw a 52% majority of its citizens elect to leave the European Union (EU). This has come as a shock to many, since none of the EU’s current 28 member countries have opted to leave since the signing of the Treaty of Rome in 1957 establishing the European Economic Community. According to many polls, one of the biggest influences for Britons opting out of the EU is the scale of immigration in the UK, which has seen added pressure to both public services and the job market. Another driving force influencing the election was a general displeasure with the direction taken in Brussels since the UK’s inclusion in the EU. The campaign in favor of leaving argued that Brussels has been looking to grow its influence and was seeking additional political integration, which is very different from what many in the UK thought Britain originally voted for in 1973. The consequences of the British exit, or Brexit, are already apparent, as global stock markets sank severely and Prime Minister David Cameron announced his resignation. According to Cameron, The UK will invoke Article 50 of the Lisbon Treaty once his successor is in office. Triggering Article 50 involves a government officially notifying the EU of it's intent to leave. This would then begin the two-year negotiating period regarding the terms of exit, which must be approved by the European Parliament and a qualified majority of 20 of the remaining 27 EU members. During these negotiations, Britain would not be allowed involvement in any EU discussion regarding its exit but would still participate in other EU business as before. Essentially, there is no timeline specified as to when Article 50 must be triggered following a referendum. This leaves many countries, within and outside of the EU, concerned over the possibility of a long and drawn out period of uncertainty. A major implication after an exit is that the UK would no longer be included in any trade agreements that non-EU countries have negotiated with the EU. While economists predict market and currency instability in the short-term, long-term consequences on many key business proceedings rely greatly on how the UK chooses to disengage itself from the EU. These include issues regarding trade, unhindered movement of labor across borders, economic growth and credit availability. Another primary concern is that other EU countries will follow suit, possibly overturning years of expanded global integration and free trade. This, in turn, could have a negative impact on global economic growth in the short and long term. With the United States being the largest foreign investor in Britain, the decision to leave the EU may result in significant consequences for American companies which employ more than a million people there. With many of these companies considering the UK as the gateway to free trade with the 27 other countries that constitute the EU, Brexit threatens to end the access to these markets. This could lead to substantial revenue loss and the likelihood of some companies having to relocate their European offices. The resulting volatility in the financial market paired with uncertainty in relation to global growth could cause US companies to display caution in investing and hiring. This could also drive investors to the safety of the dollar, strengthening the currency in the short-term. As a result, the cost of US exports abroad would increase while the cost of imports into the US decrease. This might be good news for consumers but it could ultimately result in a drag on US economic growth. An upside to such a scenario would be continued lower interest rates, which will make borrowing for both consumers and companies less expensive. This has already been evident with rates decreasing following the Brexit vote. Furthermore, American consumers typically don't spend if the market looks uncertain. If American consumers don't spend, the US economy doesn't grow. If the US economy does not grow, it tends to have negative repercussions on the rest of the world. Therefore, a hike in interest rates – at least in the short term – is not likely. Financial market uncertainty is causing the Federal Reserve to be more cautious. They will continue to wait and assess the after-effects of Brexit before considering an increase in rates again. The fallout from Brexit will likely motivate the Bank of England, European Central Bank and Bank of Japan to cut interest rates as well. Such a cut would be the first by the Bank of England in seven years. These efforts would be designed to shore up any economic volatility in global markets until there is a greater understanding of how leaving the EU will ultimately impact the UK, the EU and their respective trade partners. Receivable Savvy helps its members understand issues around customer master data, order management, credit management, invoicing, accounts receivable, payment, collections management, cash application, compliance and internal controls. For more information, visit us at www.receivablesavvy.com or https://www.receivablesavvy.com/blog/brexit-us-businesses-accounting-part-1/.